2019 Summer Season Dates: June 14 - September 2. Also open weekends only through September 22, 2019, weather and conditions permitting. 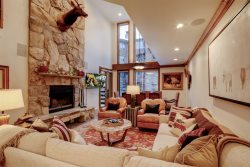 Deer Valley Resort is based on the foundation of first class service. From ski valets to exceptional on-mountain dining, Deer Valley provides guests with an unparalleled ski experience. With terrain to suit all levels of skier ability there is something for everyone. The resort limits daily lift ticket sales to 7500. With more than half of the lifts being high-speed, this provides one of the highest uphill capacities in the U.S. Located in Park City, Utah, Deer Valley is approximately 36 highway miles from the Salt Lake International Airport. The average ski season snowfall is 300 inches. The base altitude of Deer Valley is 6,570 feet. The altitude in the mid-mountain area is 8,100 feet. The altitude at the Empire summit is 9,570 feet. During the summer, Deer Valley Resort provides lift-served mountain biking, hiking and scenic chairlift rides, Summer Adventure Camp for children and music-filled evenings at the Snow Park Outdoor Amphitheater. In addition to on-mountain activities, Deer Valley Resort realizes that dining is an integral part of any vacation. You will find many dining options offering award winning cuisine. Contact our concierge service for detailed information and reservation assistance.